The genesis of modern Gurgaon is a tank and a village dating to the period of Lord Krishna’s Mahabharata. 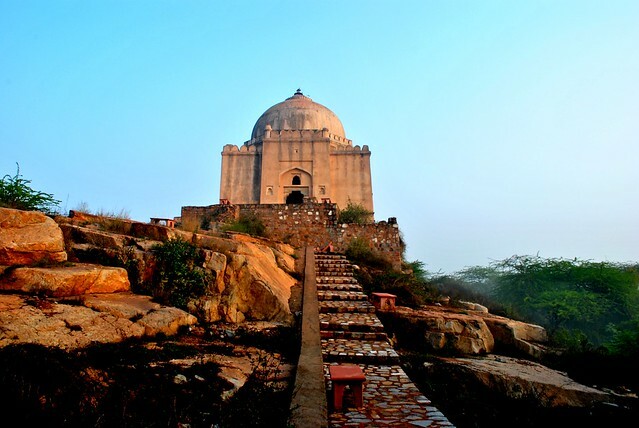 Qutub Khan's Tomb dating back to the Mughal era still adorns the city. One such architectural marvel from the Mughal period, about 2 km from the present day Old Thana at Gurgaon, is the tomb of Qutub Khan. Made of red sandstone and built in the traditional Mughal style of architecture, the tomb was built sometime in the late 18th century, about 450 years ago by a Mughal courtier, Qutub Khan. The architecture and attention to the minutest detailing on the walls is worth appreciating. As of now, the tomb is in a completely ruined condition and is currently a protected monument. It is under the ASI for renovations and conservation.